Sadly, today I noticed there are no bees! The sage and lavender have just a few flowers, the rosemary has none. 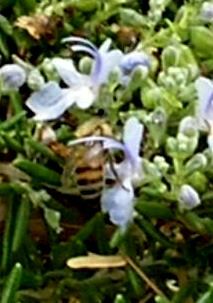 Usually the bees can’t get enough of the rosemary and usually it is covered in blue flowers. The mock orange is covered with buds but no blooms. This is all very strange; where are all my little friends? Where exactly! For several years now the bee population has been in decline. I wrote a post about the decline of our pollinators in February of 2010—you can read it here. Today I am happy to report that everyday people are getting actively involved in finding a solution, will you join us? Come on over to the Bee-a-thon being live streamed today at Your Garden Show. In partnership with Citizen Science, Your Garden Show is hosting speakers from around the world discussing the threats facing our pollinators and what we can do to help. While you are there, sign up to Join the Bee Count. Counting the bees only takes fifteen minutes and will assist scientists to map colonies across the United States. You can make a difference! Simple changes such as decreasing your use of pesticides and including native plants in your landscape will make a large impact over time. After all, a bee-healthy environment will be healthy for everyone! For more information on the plight of the pollinators and the organizations working to save them, such as the Xerces Society, read my previous post. For wonderful bee inspired artwork visit Pencil and Leaf.